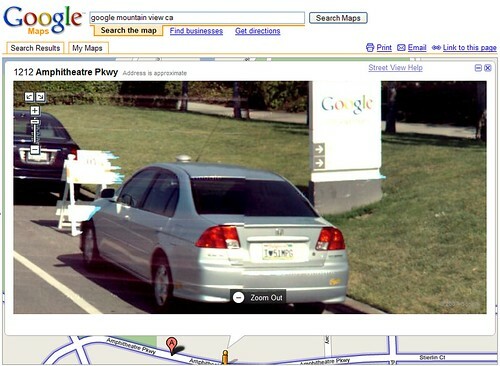 The New York Times’ Miguel Helft has a piece this morning on the privacy implications of Google’s Street View. I found this picture of a Civic Hybrid parked near Google headquarters the other day. You can clearly read the “I (heart) 51 MPG” vanity plate. He notes that Google worked with the Safety Net Project at the National Network to End Domestic Violence to remove pictures of shelters. I think the privacy issues here are limited. The images are devoid of most context. You don’t when or why someone was in a particular place. From the picture above, all you can tell is that someone who drives a Civic Hybrid with the plates “I (heart) 51 MPG” parked near Google. But you could get the same information (and more) driving down the street. Yahoo! employees have been using flickr to embarrass bad parkers. This picture of a scooter parked in a carpool spot is one of my favorites. Still, from a privacy standpoint, I prefer the fuzzier images that appear in Google’s Street View outside the Bay Area. Google did its own imaging in the Bay Area and licensed images from Immersive Media for other markets. In New York, I had a much harder time making out faces or signs. The pictures are clear enough to get a feel for an area without the high level of detail you find in San Francisco. This entry was posted in google, maps, privacy, street view. Bookmark the permalink. It’s not the same spot, the Google signs are different. I figure people who get vanity plates understand that others might take pictures of them. What is in public view is fair game. Duh!! !